Designed for firefighting with a low-profile bezel that minimizes interference with other gear, an adjustable beam, and a spring-loaded hook for pockets or harness straps, the intrinsically safe Streamlight Survivor Right-Angle Flashlight helps first responders and industrial professionals get the job done. 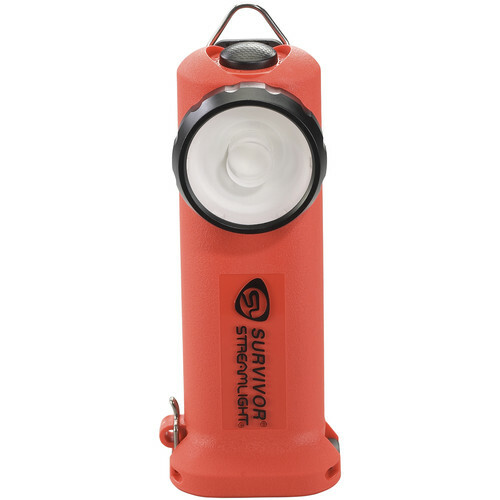 Constructed of sturdy vented nylon, the Survivor features 60- and 175-lumen brightness levels, along with an emergency strobe and a moonlight setting that will run for 20 days. A spring-loaded clip holds the light securely to turnout gear pockets or harness straps, and there's also a D-ring for wearing or hanging options. The beam can be customized—pop in the black plug to cut peripheral light for a focused, smoke-cutting spot beam, use the amber plug for light that causes less eye fatigue, or go with the default Total Internal Reflection (TIR) beam for a spot with significant peripheral coverage. The rubber-dome push-button switch is easy to operate even when wearing heavy gloves. The light comes with a 2.5-hour, 120/100 VAC fast charger.